Sometimes it is handy to give control of a something to an actor, so they can actually appear to be directly controling that something. I often do this with light switches and other physical things on the set. But what about a something that isn't part of the set but is a hand prop, and so isn't able to be wired up? For example, an actor with an electric carving knife...? This actor was just a few metres from the front row in a tiny theatre, but to this audience, this buzzing electric carving knife looked and sounded just like the real deal. The trick is to use wireless technology, essentially making the knife into a RF remote control for PCStage. 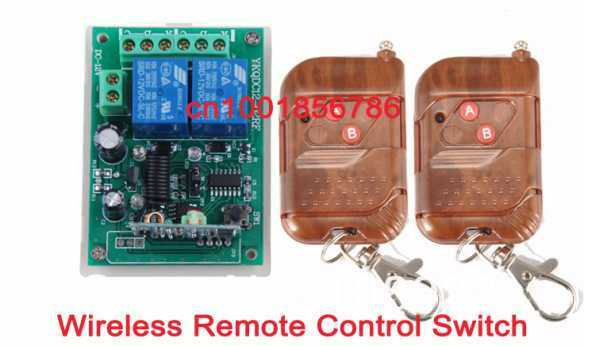 It's easy to come by RF remote control technology, and in this particular setup I purchased from a vendor on AliExpress.com, Shenzhen Wireless Remote Control and Receiver experts sell shop, (yes, that really is their name!) who delivered exactly what I wanted on the nail. I'm guessing this kit is intended for a garage remote control, or to operate lights or some similar purpose. I picked this vendor of the many hundreds on AliExpress as they were able to supply kit to operate on 433MHz, necessary for New Zealand, rather than the more common 315MHz used in other jurisdictions. This complete wireless remote kit (one receiver, two transmitters) cost $16.39USD, with free shipping. The pictured receiver comes in a white box, intended for mounting on a wall or somesuch. All the receiver needs is a 12V supply and setting a jumper correctly. 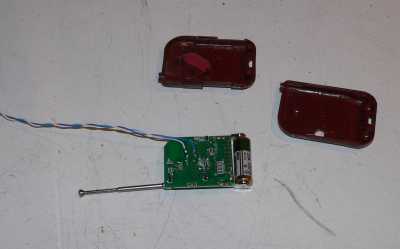 The remote was modified to have flying leads (actually an offcut of Cat5) parallelling button A, these leads would later be attached to the real switch in the knife. These were actually quite big remotes, and their size appeared to be determined by the width of the 12V battery. It is pictured without blades as they had already gone to visit the bench grinder to remove the teeth, to prevent any accidents. Three removed screws later (one of which was a safety torx, how inconsiderate of the manufacturer!) we were in. Urgh. Clearly a well-used specimen. Note the safety lock button inset in the switch, which is mentioned later on. So the motor had to go, but the blade mountings needed to stay. Conveniently the critical place needing to be cut was made of plastic, so it was easy to chop through it, and discard the motor and associated gubbins. A bit of further disassembly gave access to the switch contacts, and these were cleaned up, as they were badly corroded through years of switching motor current. The remote was just popped in the body complete, held in by a bit of suitably bent Meccano. The antenna was extended as far as possible. 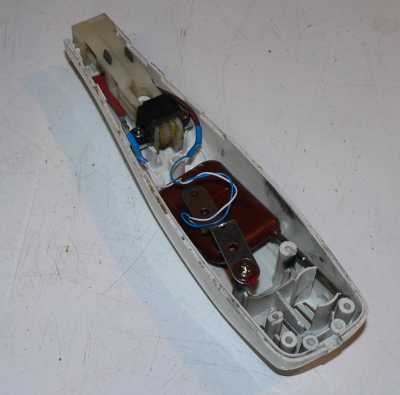 After the original switch and the wired from the remote were soldered and heat-shrunk, the knife was reassembled. Aside from some weight loss and there being no cable as originally fitted, it looked and felt just like the real thing. The final modification was to remove the safety lock, so as to ensure the knife couldn't be accidentally be locked off and safe, as that could have lead to all sorts of operational difficulties on-stage. There are two parts to this, firstly connecting the remote control receiver to PCStage, and then secondly, programming PCStage to do the right things in response to the actors control. There are two convenient ways to interface contact closures (which is what the relay output of the remote control is) to PCStage. The first is by using joystick inputs, using an off-the-shelf joystick interface. A readily available interface unit is the Manhattan USB Game Port Adapter, but any game port adapter should do the job nicely. PCStage has a plugin to connect to game port devices. The second method is by using a contact closure to MIDI message device, which is what I actually used on this occasion. I use (and recommend) the MidiTron interface for this, which is a neat off-the-shelf solution that works, but is by modern standards, somewhat expensive, despite a significant price drop since I purchased my unit. Other possibilities include the Highly Liquid MIDI interfaces and even assembling something using MidiBox modules. Arduino folk will know what to do. 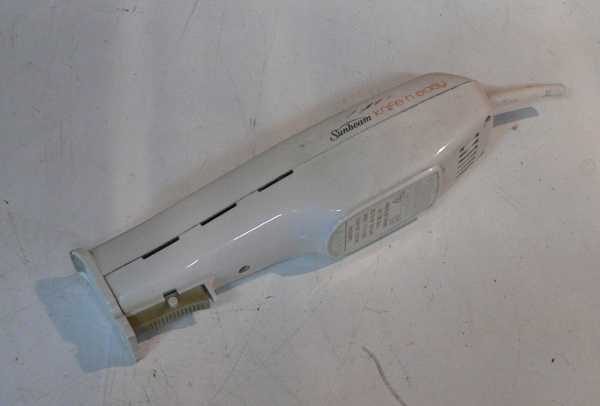 An electric carving knife is one of the more complex examples of this sort of application. In sound effect terms, the sound needs to start from nothing, build to a (loopable) middle bit, and then slow down to silence. To do this, the start point was a recording of an electric carving knife from rest, starting up, running, and stopping. This was edited to form three separate recordings, knife_start.wav, which included a bit of steady running too, total duration about 250mS, knife_run.wav, about 5.5 seconds, and knife_stop.wav, about 600 mS. When the KNIFE_GO cue is taken, playback will start with the knife_start.wav sample. A tenth of a second later (note up fade hold time is set at 0.1 sec), the next cue will be automatically taken (Flag N, next), which is the looped knife_run.wav sample. This will then play forever. Forever, that is until the KNIFE_STOP cue is taken. This will cause the knife_stop.wav sample to be played, which ends in silence. All of the samples are set to emanate through PCStage track called FX1, and a track can only play one sample as a time, so as each new sample is called, it will replace the existing playing sample. The MidiTron unit was configured to emit a MIDI Note On (note=41 velocity=127) when the input went high, and a MIDI Note Off (note=41 velocity=0) when the input went low, all on Channel 16. Note that PCStage thinks that a MIDI Note Off is a Go, and a MIDI Note On is a stop. This is upside down to what might be expected; this behaviour is because the relay contact is connected with a pull-up resistor, so when the relay closes (casued by the knife switch which has been operated by the actor) the input voltage drops to zero. When the relay opens, the input voltage recovers to the 5V supplied through the pull-up resistor. Perhaps I should have used the normally closed relay contacts to eliminate the possible confusion! The configuration so far delivers a knife that will appear to operate whenever its switch is operated. This is perhaps a bit scary as if the switch is accidentally operated backstage the knife would still sound out front. PCStage addresses this problem through using cue filters. Triggers can be restricted in when they are able to operate, to single cue(s) or range(s) of cue(s) on the default desk. For this effect the triggers are only able to operate on a single cue on the, the cue with the ID 400. Looking at the picture of the production triggers above, note the Cue Filter column. Note that there are a pair of cues the only purpose of which is to arm and disarm the knife effect. Finally, PCStage track FX1 was routed through a separate audio output and separate amplifier to an effects speaker that was placed backstage not far from where this action takes place, maintaining the illusion that the sound of gnashing baldes really is coming from the knife.